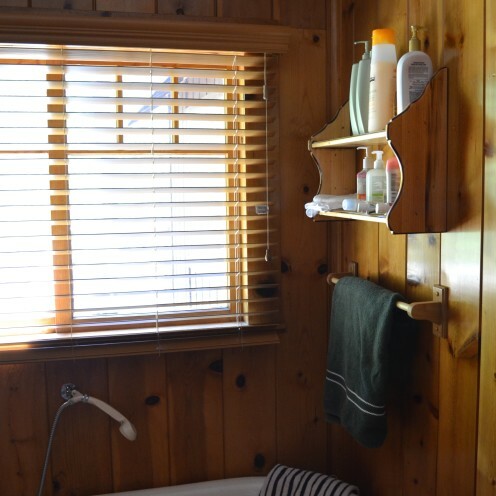 I’m INTRODUCING MY LOG CABIN BATHROOM RENOVATION to you! 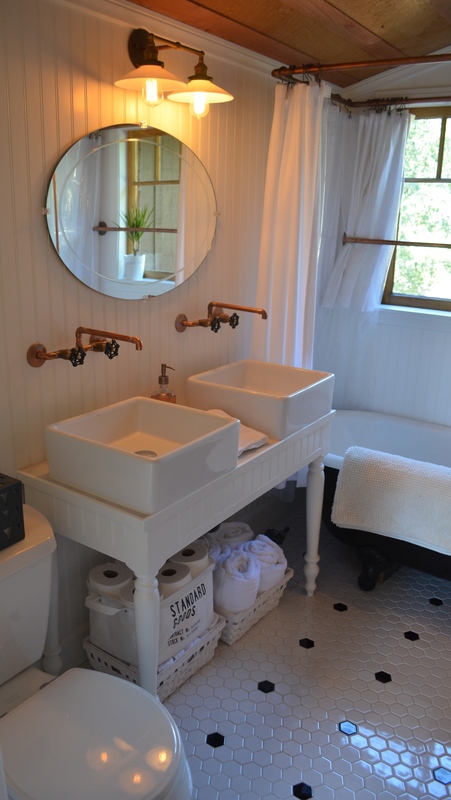 But, before I make the big reveal, let’s take a sentimental journey back to see the original bathroom. 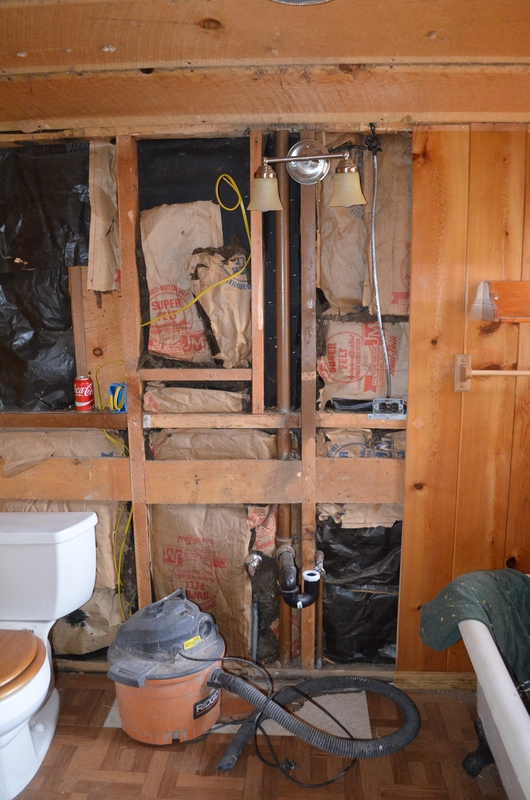 Here is what our bathroom looked like when we purchased the cabin. 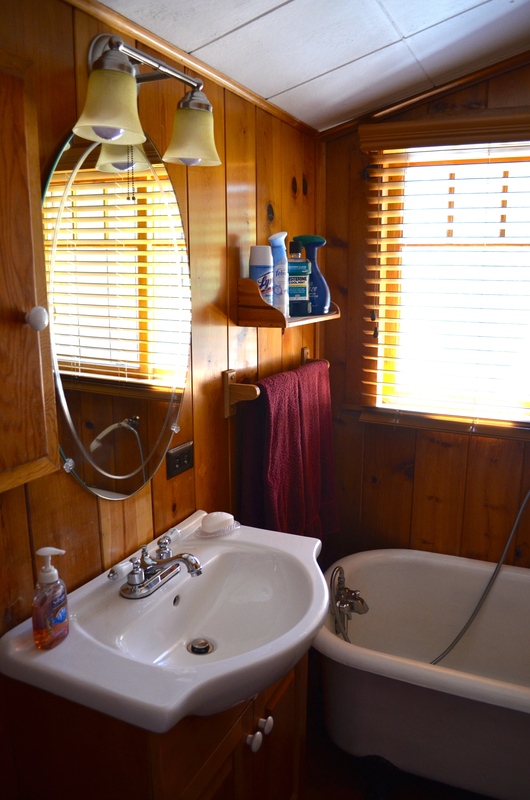 The bathroom was an add-on to the original one room log cabin. 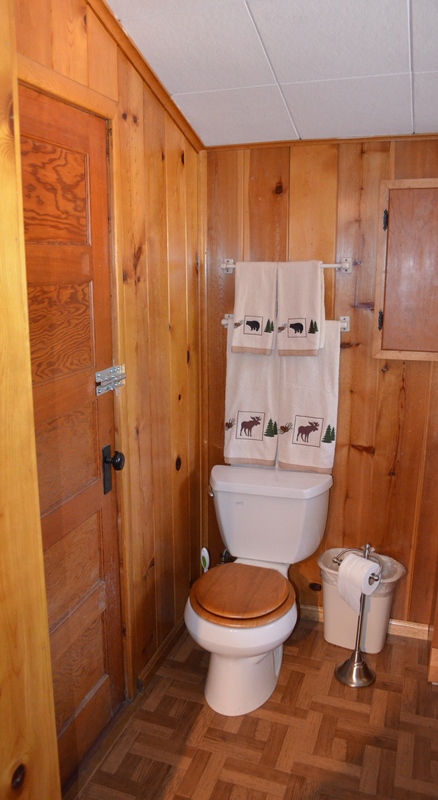 As I understand it from neighbors, there was once an outhouse in its place. Wasn’t she a beauty? 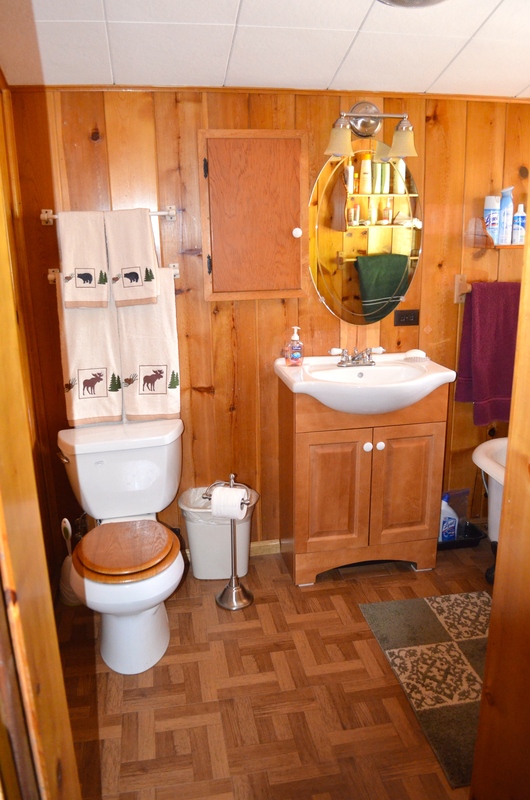 Notice the fake parquet flooring, actually sheet linoleum. 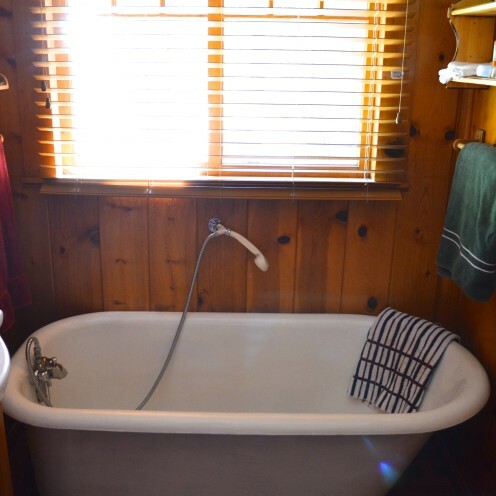 The knotty pine paneling might have been somewhat acceptable if it had been tongue and groove, but, instead, it was cheap paneling made to look like tongue and groove. 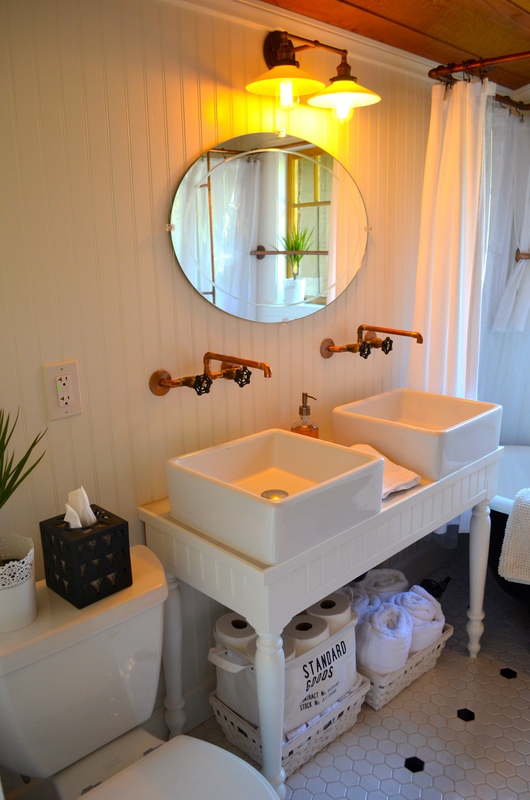 I am a big fan of pedestal sinks, but this one did not fit the period of my 1940s log cabin. 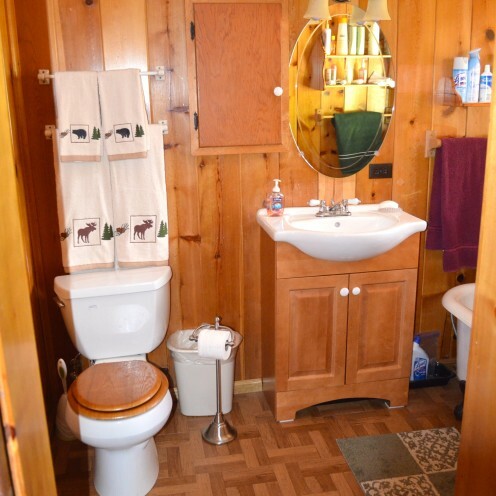 The built-in medicine cabinet was misplaced, the cheap light fixture an eyesore, and OMG, a brown, fake woodgrain toilet seat!!! I did, however, see potential in the mirror, and I loved the antique ceramic towel bars. 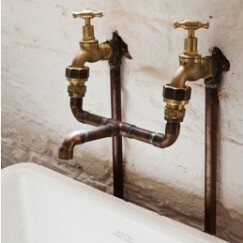 But absolutely everything else simply had to go! 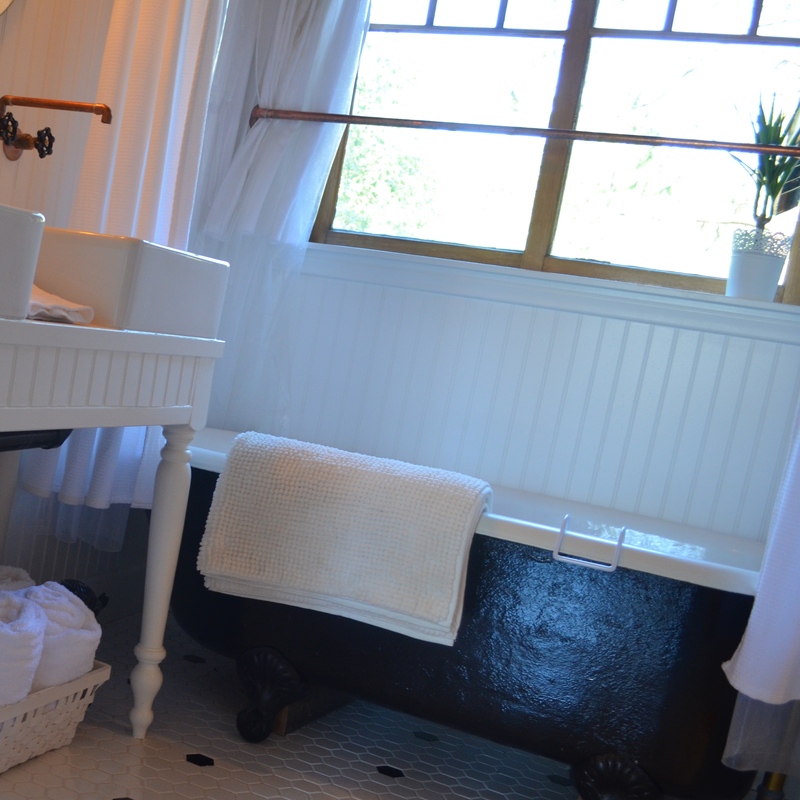 What I did adore about this bathroom was the old clawfoot tub. 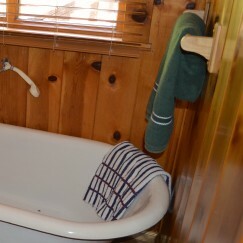 However, the lack of a real shower was something I knew I had to rectify. 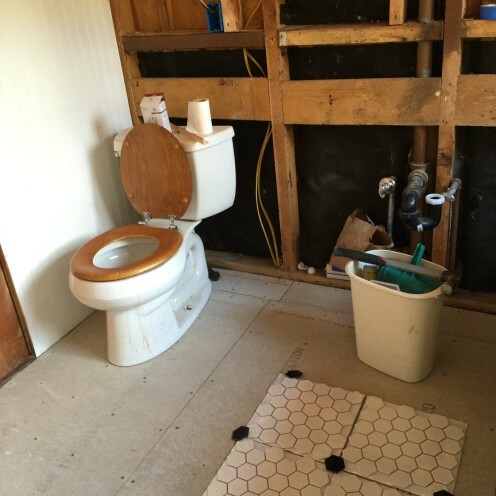 The first thing we needed to do was add new flooring. 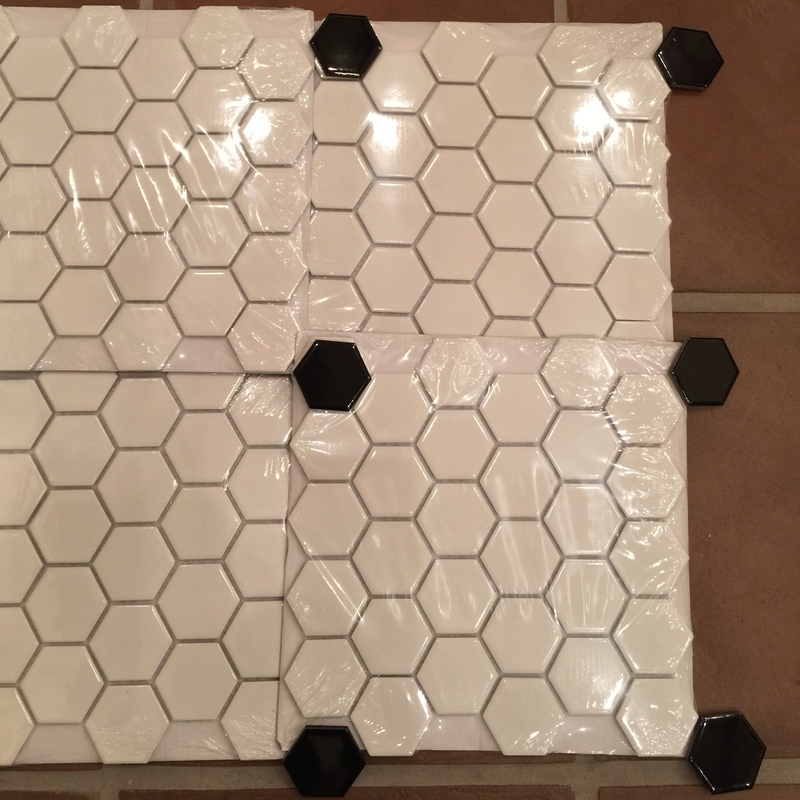 In keeping with the period, I selected these white hexagon tiles and added the occasional spot of black. Because this cabin will become a vacation rental property, “style on a budget” is my mantra. So, I ordered this 2″ hexagon porcelain mosaic floor tile from Home Depot at a cost of only $6.95 per square foot. 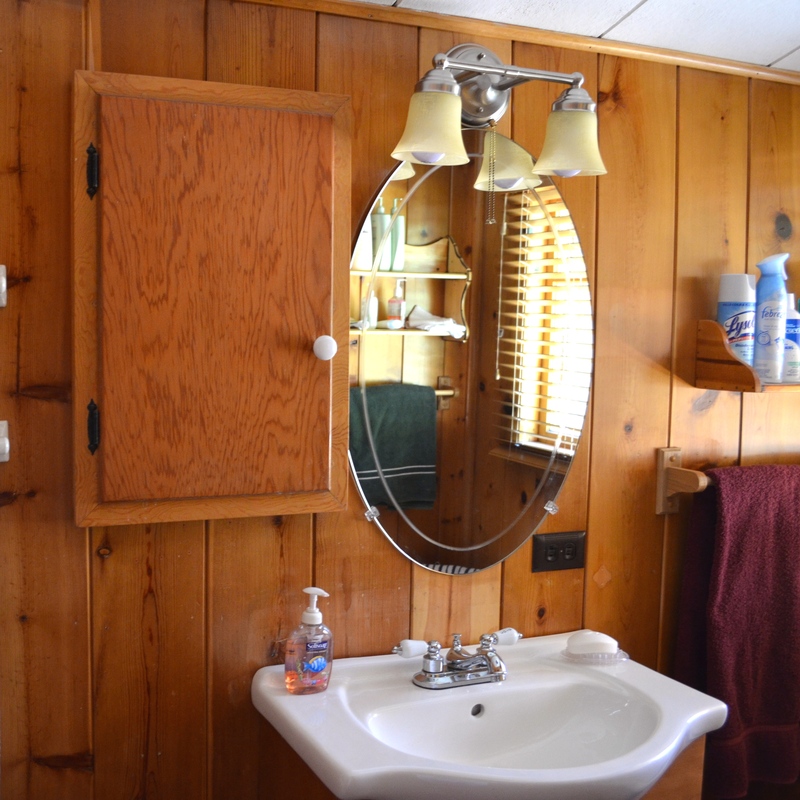 Next, we ripped out the fake knotty pine paneling and removed the medicine cabinet, pedestal sink and mirror. 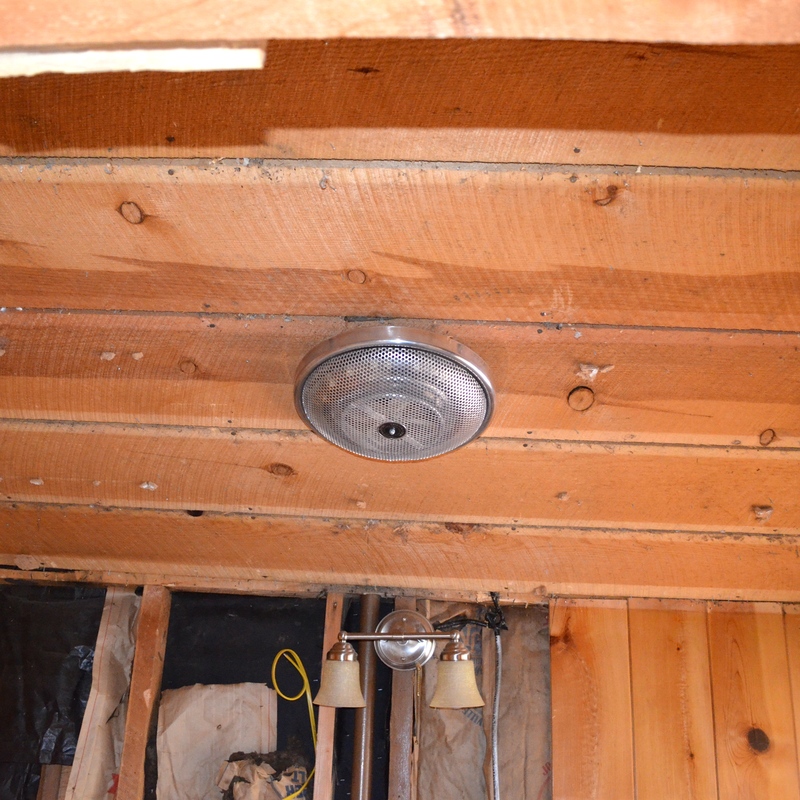 My electrician came in and updated the old electrical wiring and we added new insulation. 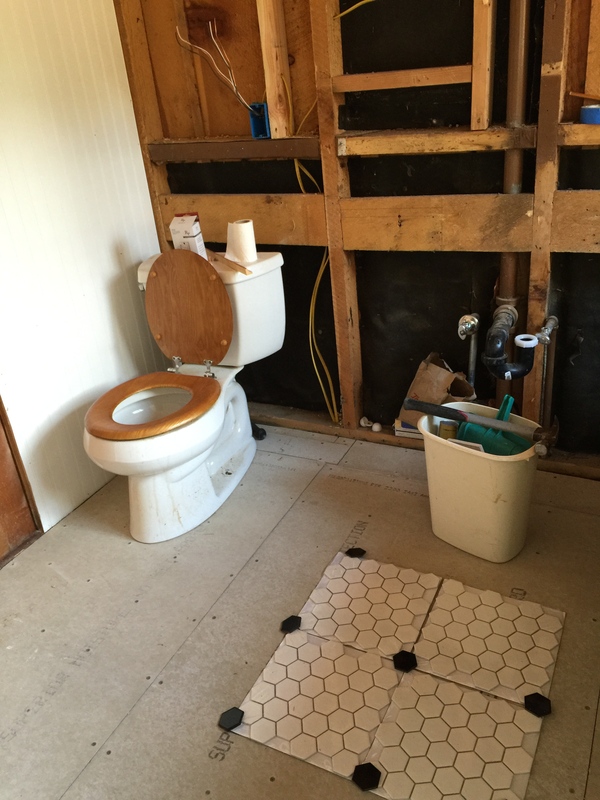 We also installed a new subfloor to support the new tile floor. 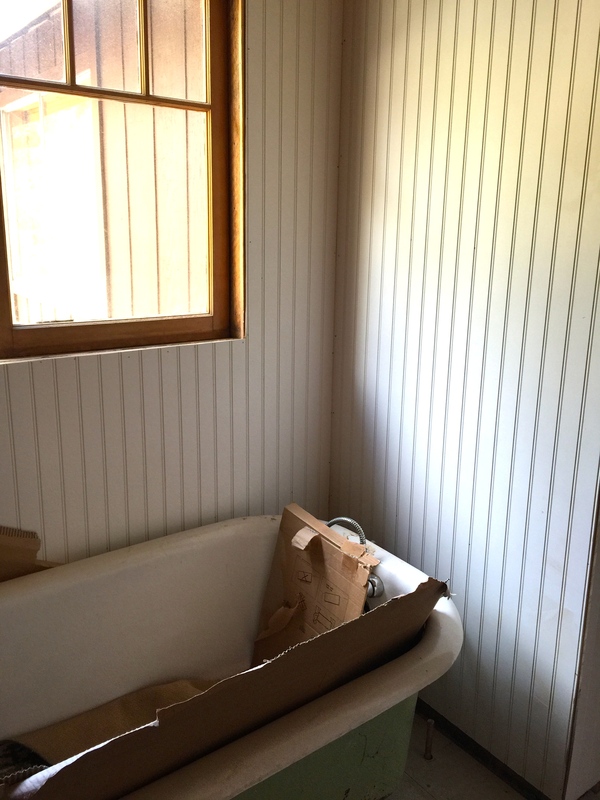 In place of the old paneling, we installed beadboard which was more in keeping with the period and really brightened things up. 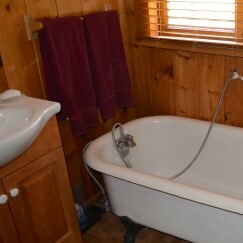 Because the ceiling is angled upward on the right side of the room, we decided to turn the tub around, relocating the the plumbing to the opposite side. This was done because it would allow more headroom for the shower attachment that I planned to add. 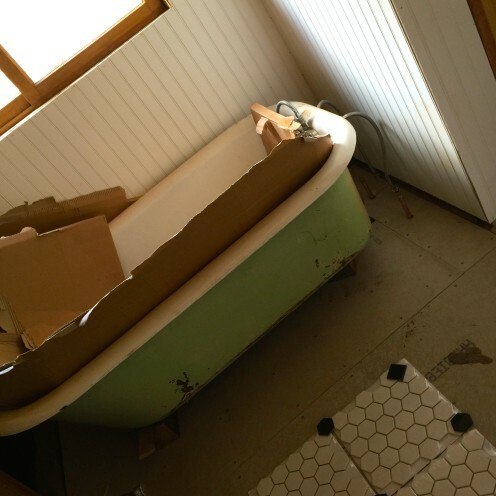 In doing so, we revealed an new, ugly side of the clawfoot tub. 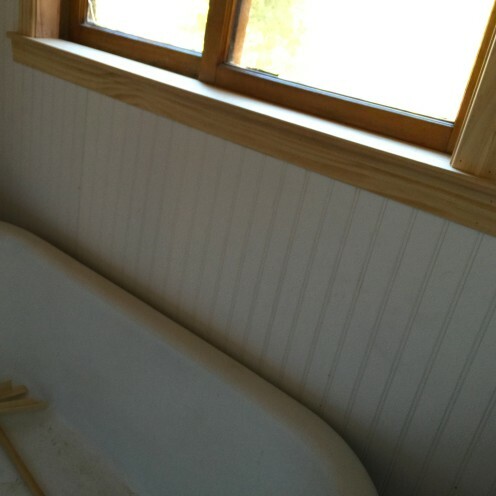 Only one side of the tub had been painted white, and now we had this lovely distressed green. and added a window sill and trim around the window. 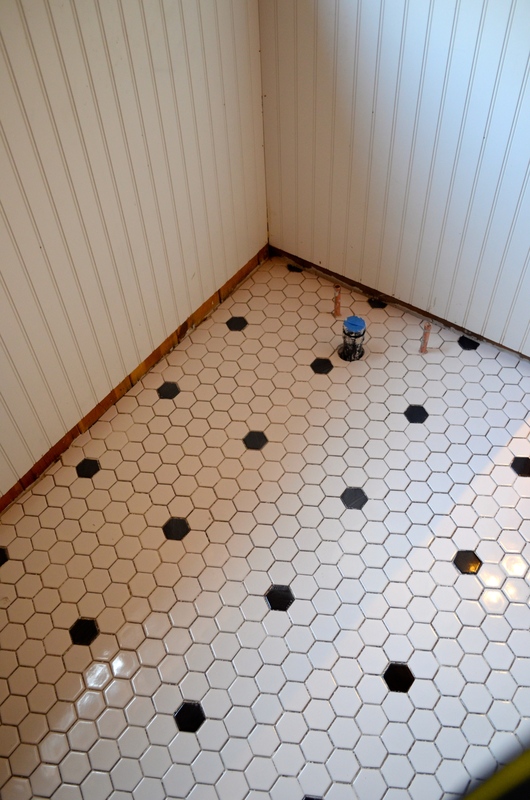 The ceiling of the bathroom was covered with these cheap looking white tiles. 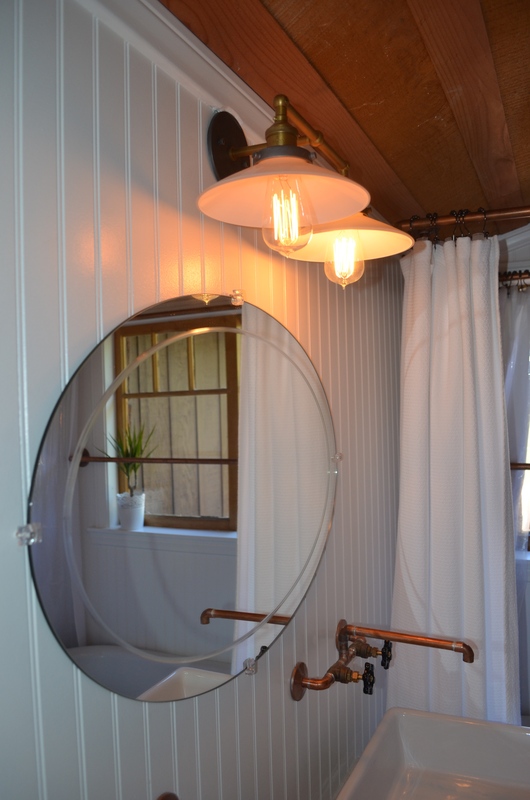 All of the other ceilings in the cabin are paneled in rough-hewn wood, a look I wanted to keep consistent throughout the cabin. 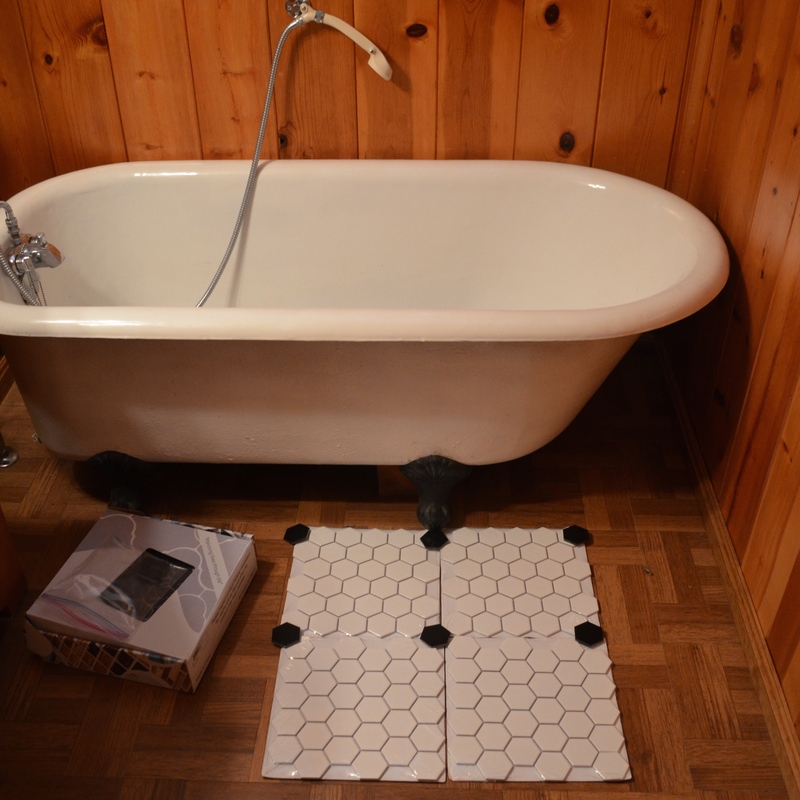 So we removed the tiles and voila, the original wood construction was revealed. 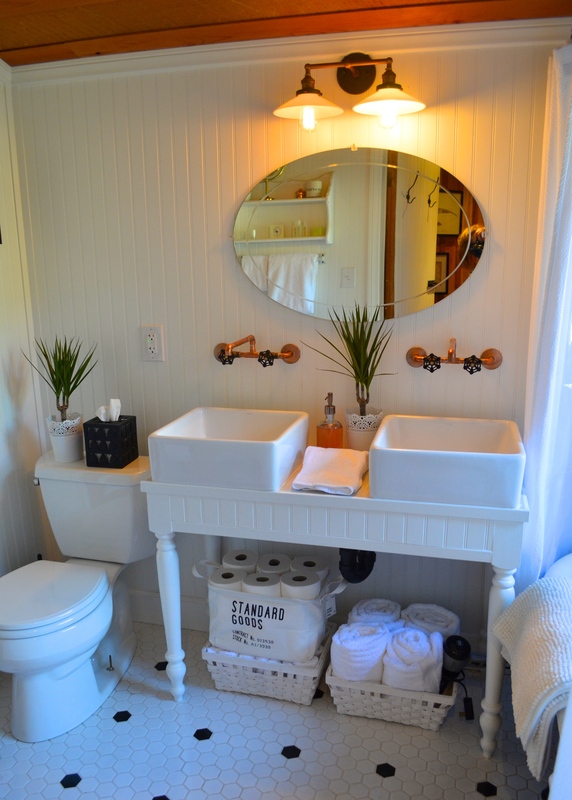 It was far more pleasing than the fiberboard tiles and all it needed was some trim pieces to give it a finished appearance. 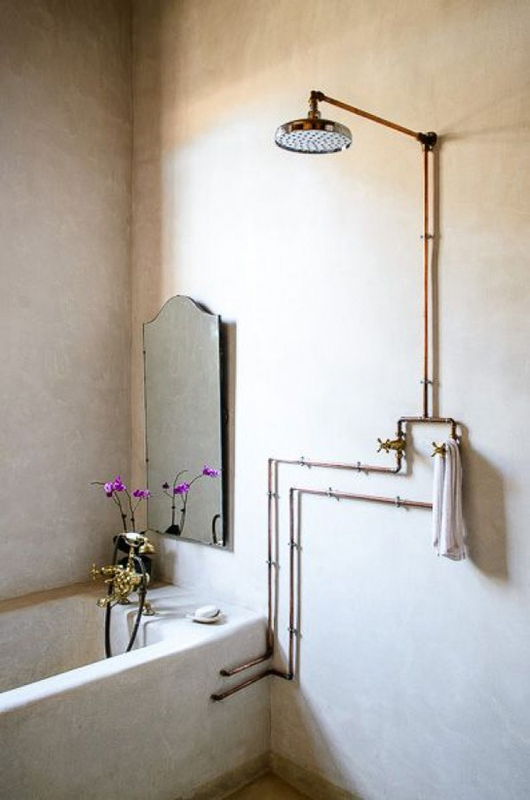 Throughout the design and renovation process, I developed a Pinterest Board dedicated to my bathroom renovation inspiration. 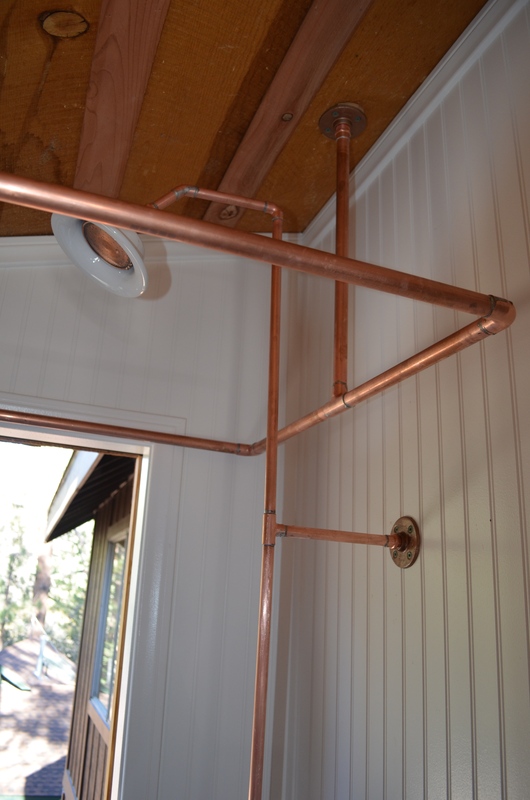 As I mentioned previously, I really wanted to try and incorporate exposed copper plumbing into my design. 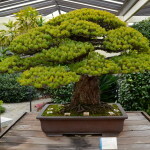 Below are some images I saved on my Pinterest Board as inspiration. 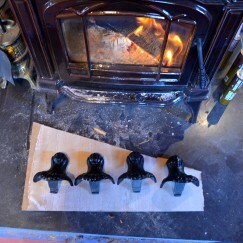 And I’m delighted to show you what we ended up doing. In addition to the fact that I love the rustic, industrial look of exposed copper pipes, it also made a great deal of economic sense to go this route. 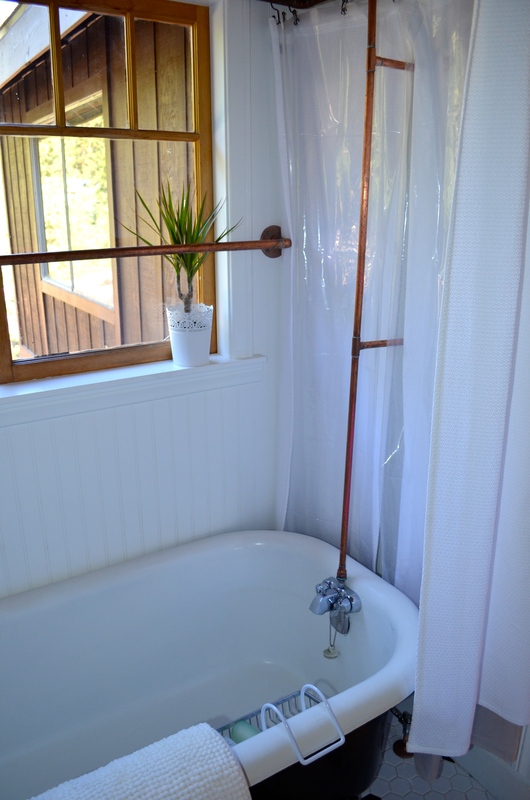 That’s because when I started researching the cost of clawfoot tub shower systems that included the shower curtain rod, they were ghastly expensive, and not in my vacation rental, income property, renovation budget! 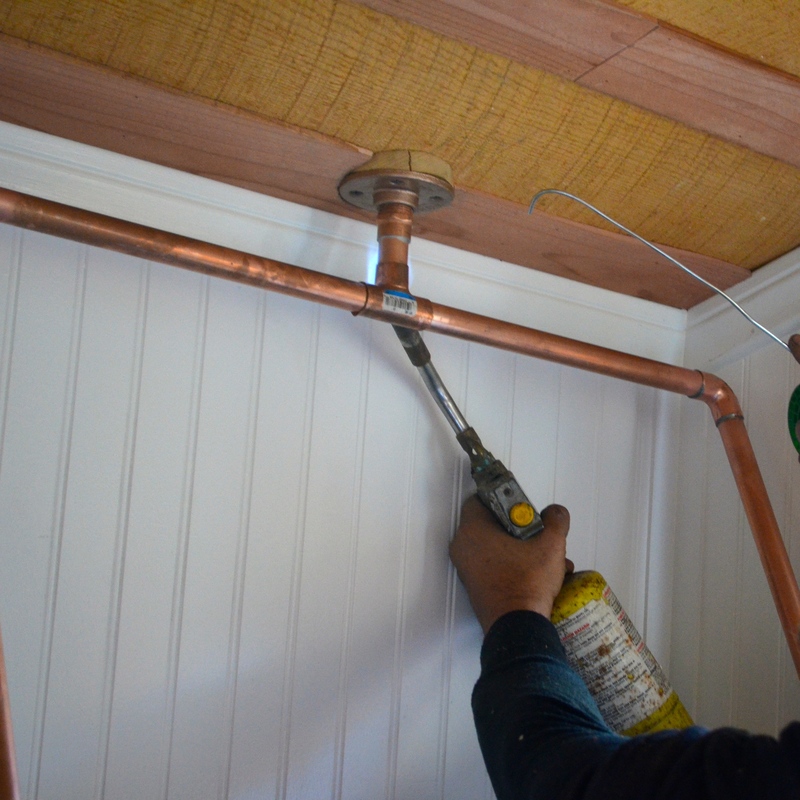 But with a little ingenuity and a welding torch we saved a bundle. 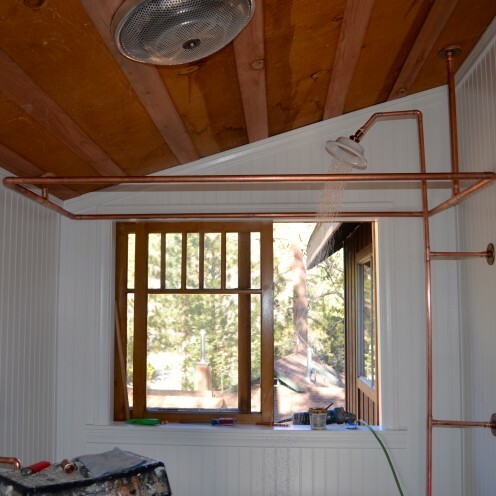 We ended up spending just a couple of hundred dollars on copper pipes and fittings to fashion this custom shower system. 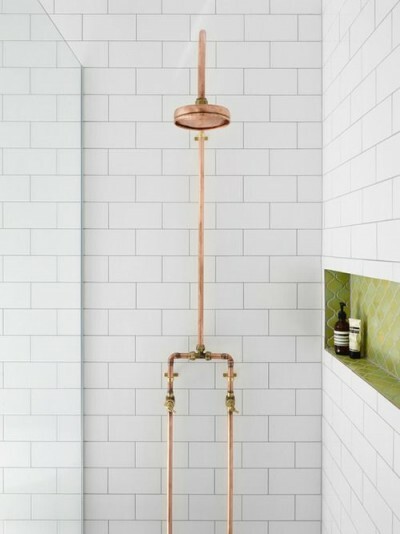 And I purchased the great looking white ceramic sunflower shower head in copper here from Signature Hardware for a mere $32.95. 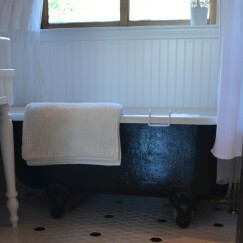 We also painted the green tub and claw feet black. 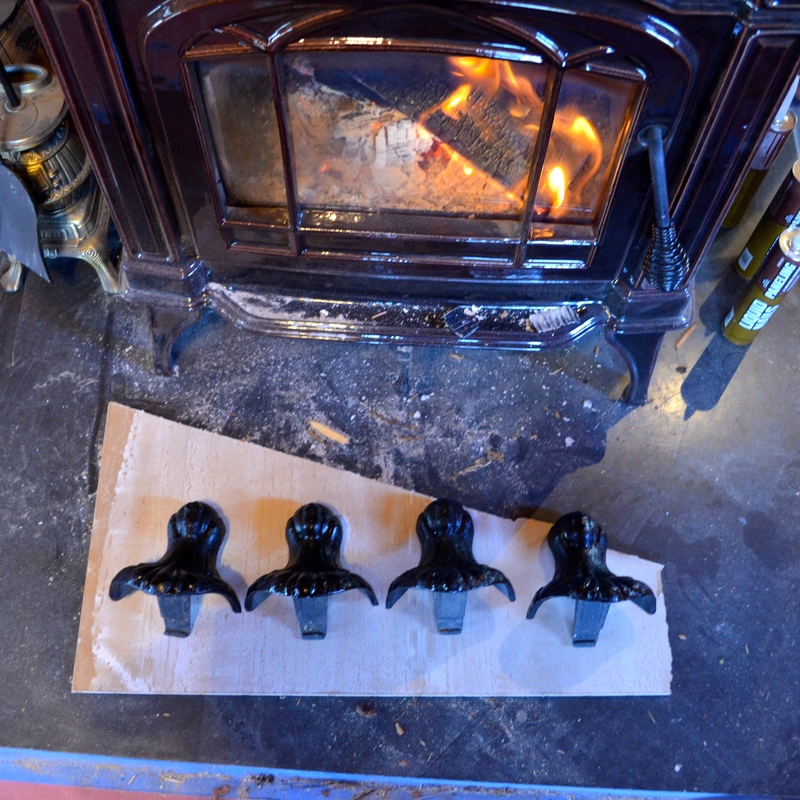 Those are the newly painted claw feet drying next to the wood burning stove. 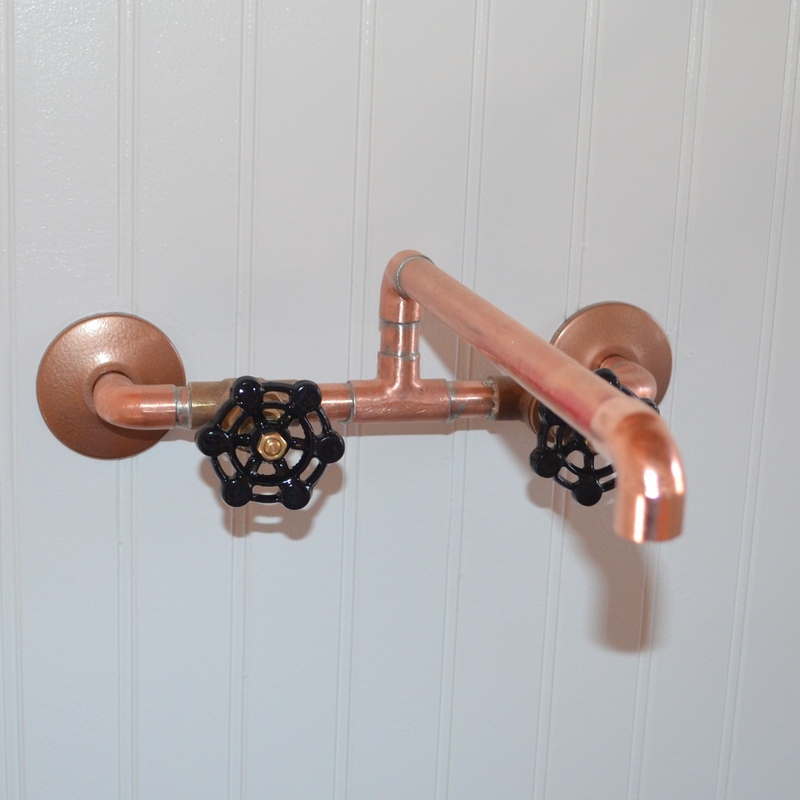 Next, we came up with this custom system for wall mounted sink faucets. 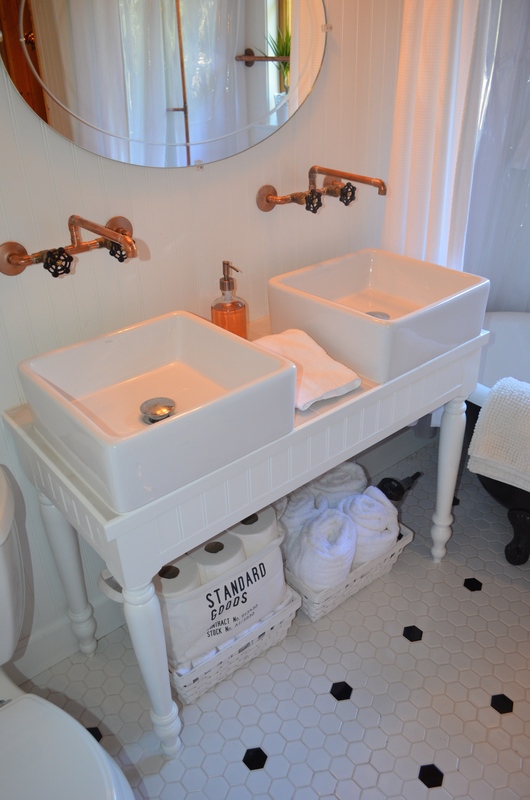 We fashioned them from pieces of copper pipe and spray painted the handles black to match the clawfoot tub. With 4 table legs from Home Depot, leftover beadboard, and leftover tile from the new kitchen floor, we fashioned this custom sink base. Our log cabin has 2 bedrooms and 1 bath, but it will sleep up to 6 people. 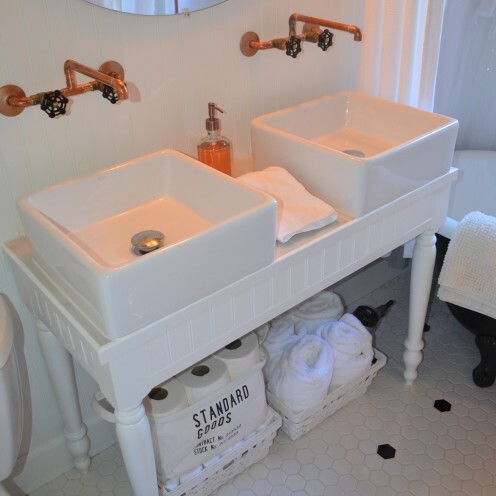 Therefore, I felt like we needed to have 2 sinks that would allow for 2 people to get ready at the same time. 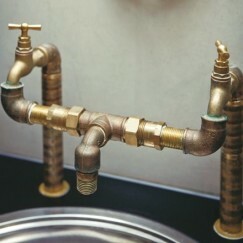 I purchased the Kräus vessel sinks from FaucetDirect.com at a cost of $109.95 each. Finding copper drain stoppers was impossible, so I settled for polished chrome. The white baskets below are from IKEA and the canvas “Standard Goods” storage basket was $12.99 at H & M Home. 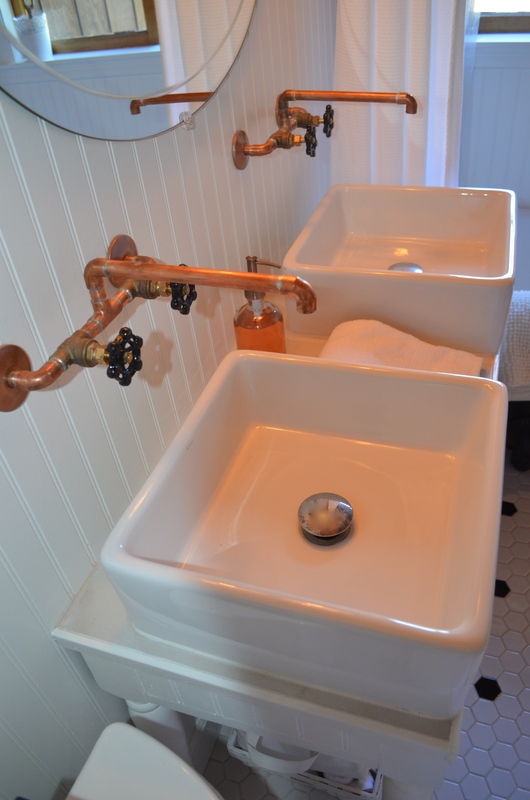 And I was so happy to find the copper soap dispenser here at Terrain. 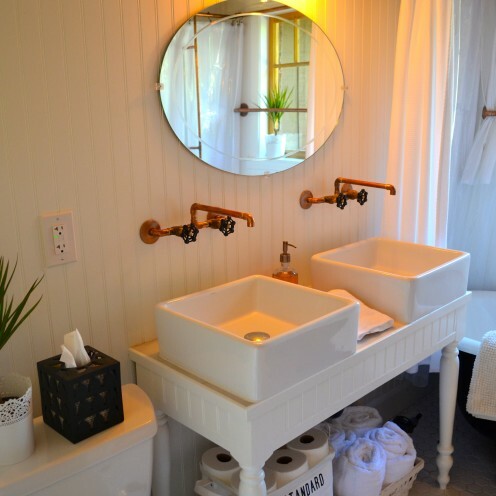 You can see that I repurposed the old mirror, turning it horizontal instead of the vertical position it held in its previous life. 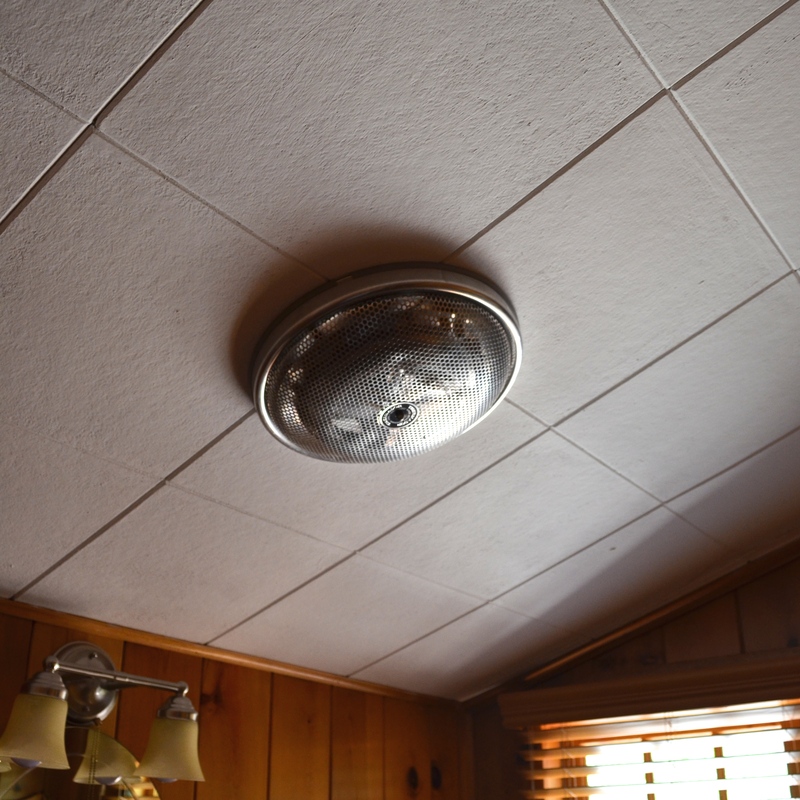 The old light fixture went to the dump and we added this lovely new one from Restoration Hardware for $219.00. 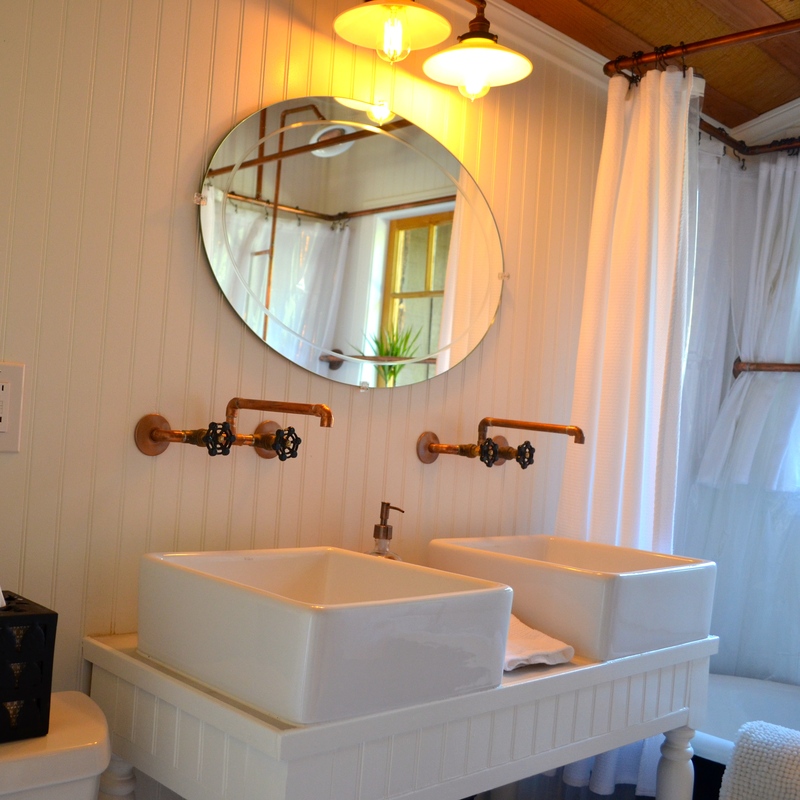 Complete with Edison style filament light bulbs it was just right for the period and complimented the copper faucets perfectly. 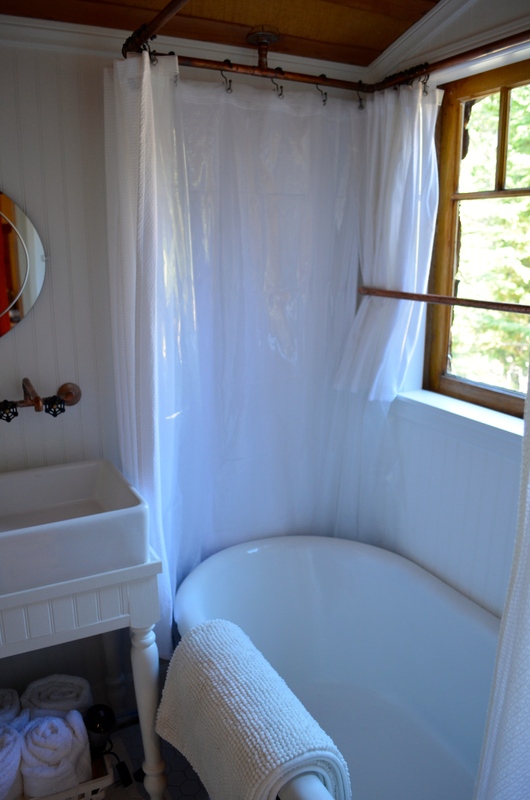 I used 4 basket weave cotton shower curtains with plastic liners from Target to fashion custom shower curtains for my rather unique shower system. 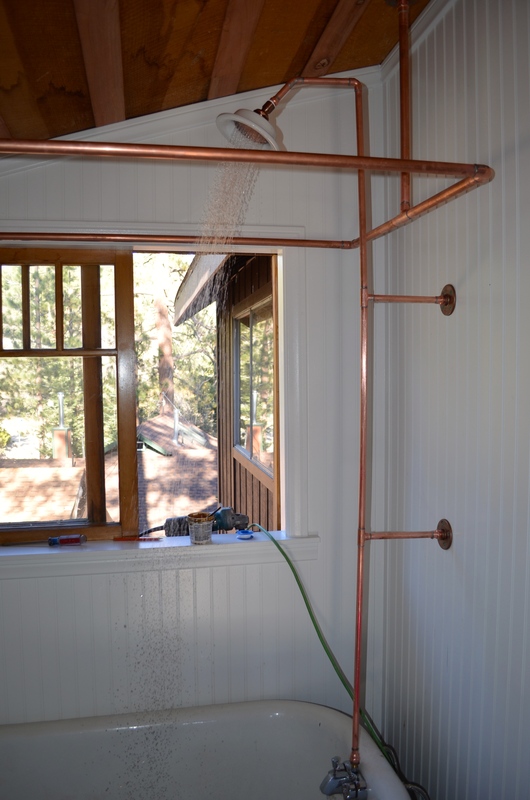 By cutting and sewing them, I got them to fit around the pipes and the window. And see that little wooden shelf that was ugly oak in its previous life? 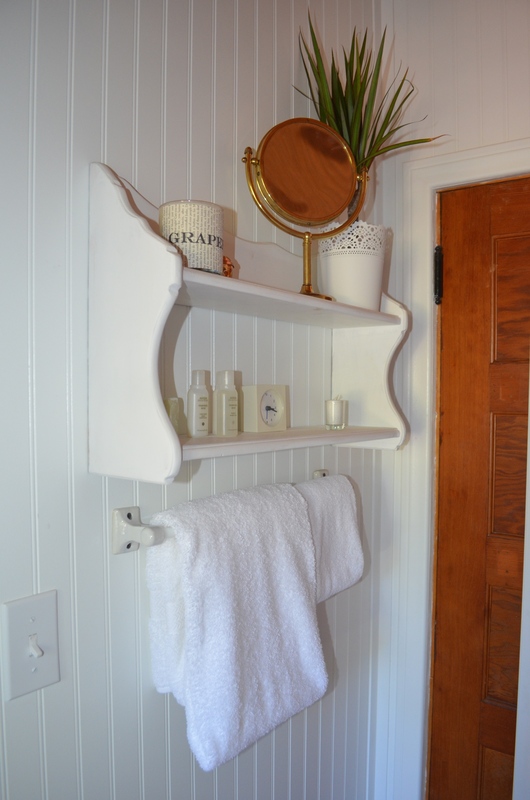 Well, I painted it with white Annie Sloan Chalk Paint and gave it new life. 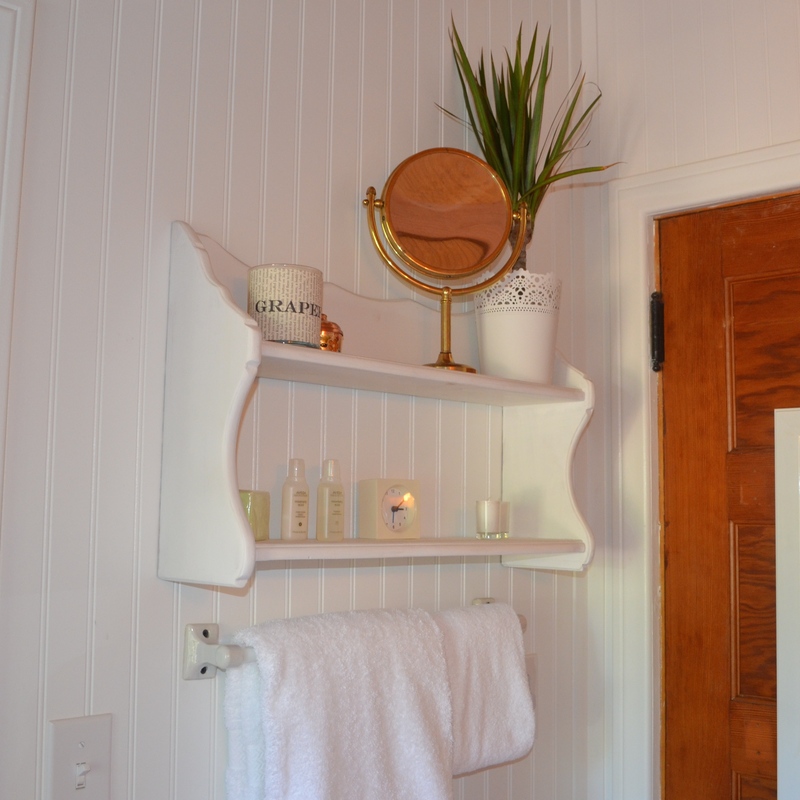 I also repurposed the old ceramic towel bar. 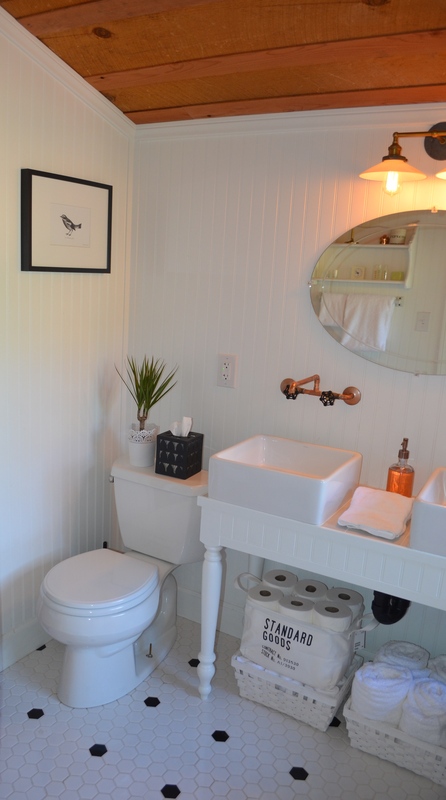 Remember that horrible wooden toilet seat? 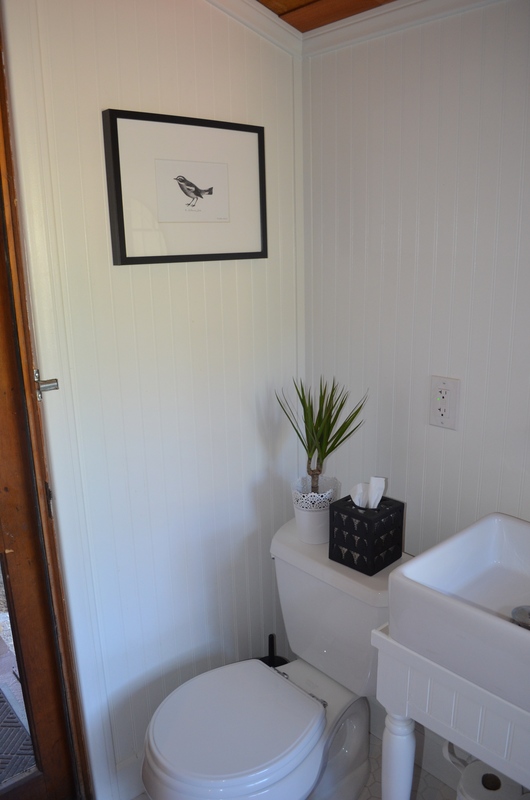 It was nothing that a nice new white toilet seat couldn’t fix, and enabled me to keep what was once a very ugly toilet. 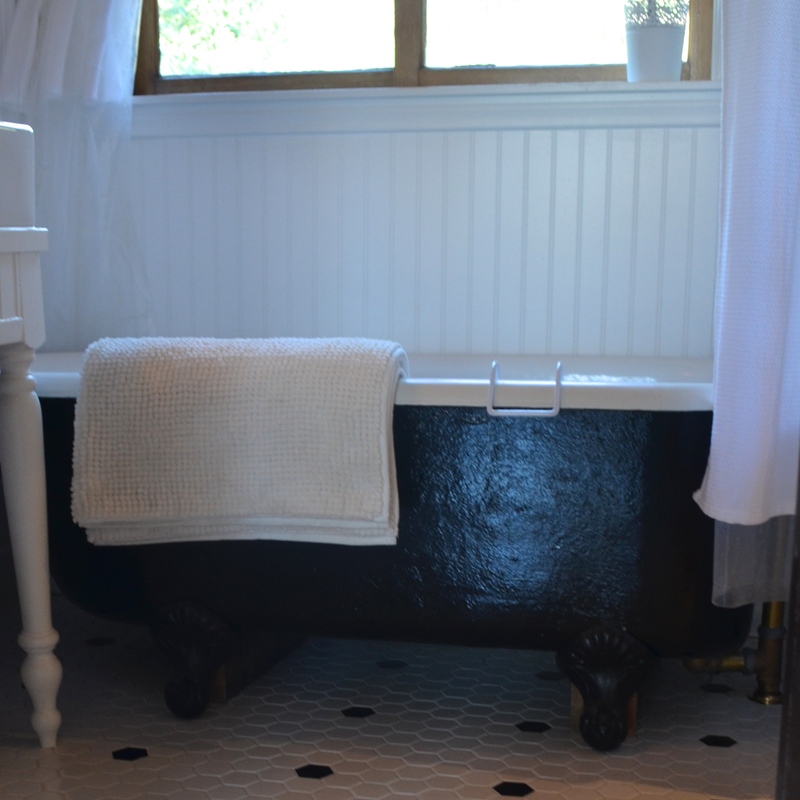 The black iron tissue box cover is from my company, The Hill Ironworks. 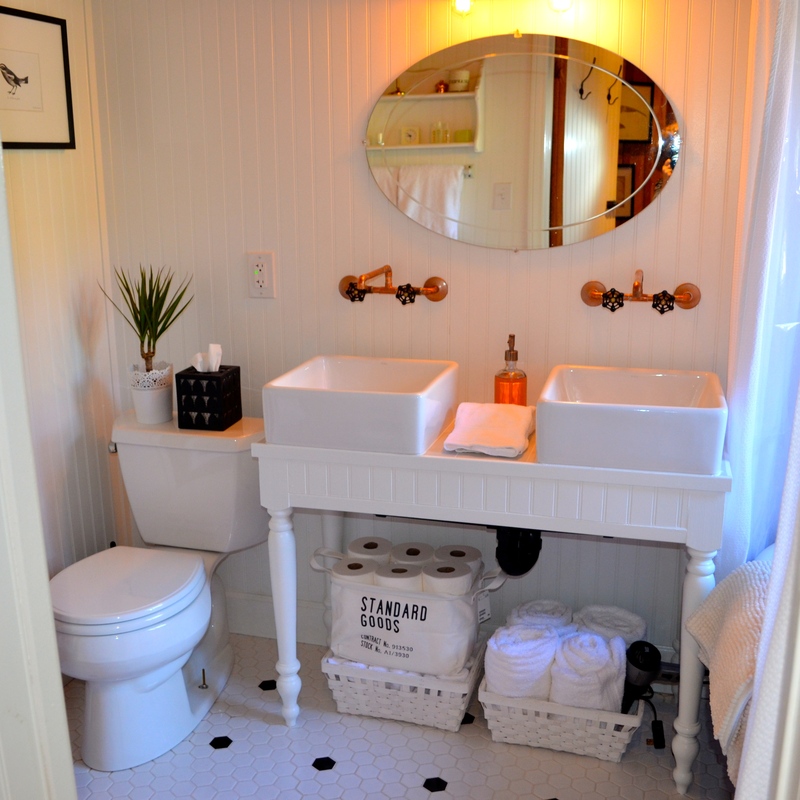 There is also a matching waste basket, not shown. 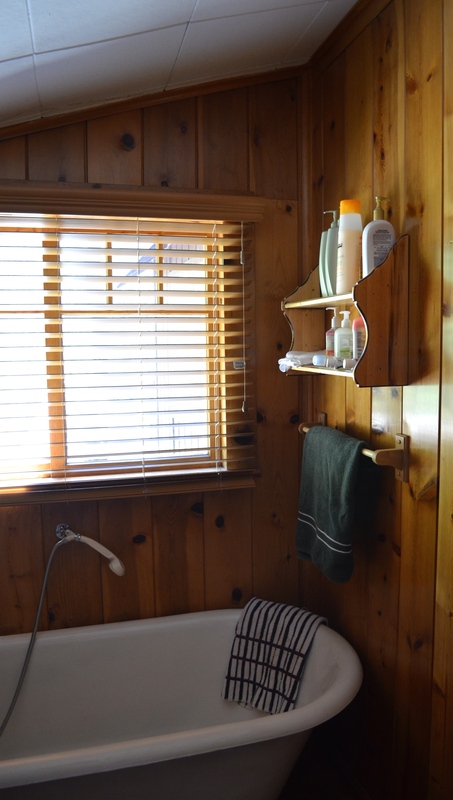 I am so happy with the outcome of my log cabin bathroom and I do hope you like it too. Stay tuned and in the very near future I’ll be showing you much, much more of my new/old log cabin renovation. 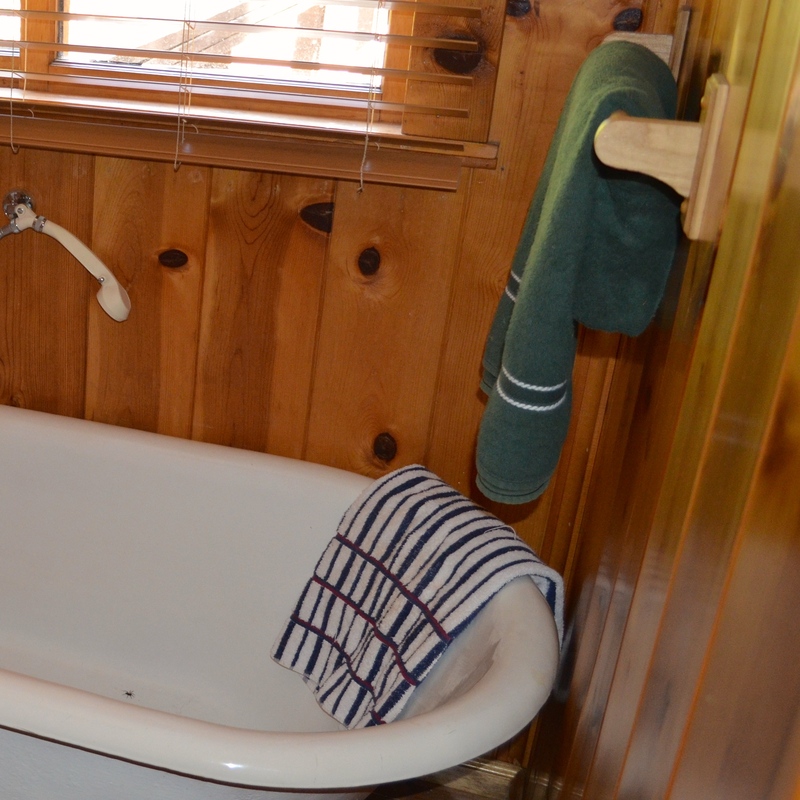 My log cabin, affectionately called Stone Hill Cottage, is now available as a vacation rental home that you can rent by clicking here. 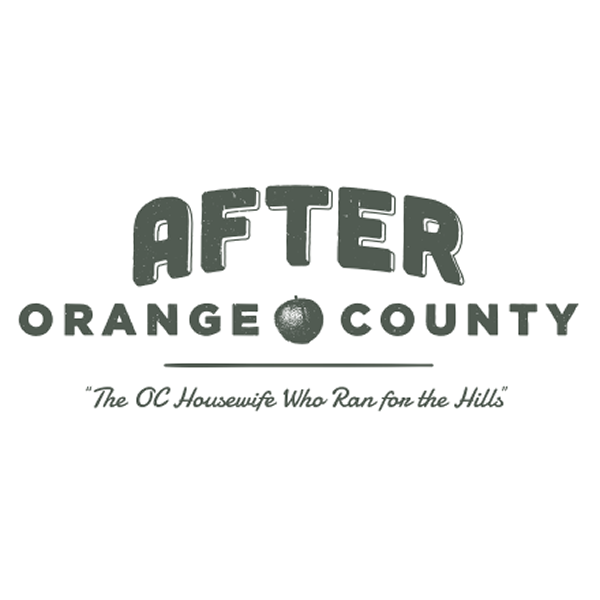 By the way, this is not a sponsored post, I just like sharing all my resources with you.